The Houston Astros have acquired their closer for the stretch run. Well, at least they hope they have. 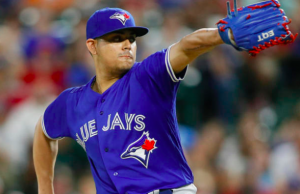 Monday afternoon, the Astros pulled off a major trade with the Toronto Blue Jays, acquiring closer Roberto Osuna. To get Osuna, the Astros have sent Toronto disgruntled closer Ken Giles and prospects Hector Perez and David Paulino. The Astros have been on the market for a closer primarily due to Giles’ struggles this season. Those struggles came to a head earlier this month when Giles appeared to curse out manager A.J. Hinch after getting pulled from a game. That incident combined with his 4.99 ERA earned him a demotion to triple-A. He is yet to return from that demotion by virtue of posting an 8.44 ERA in six appearances. Despite Giles’ problems this year, the Astros have the second-lowest bullpen ERA in the American League. That’s a far cry from last season when they won the World Series despite an ineffective bullpen. However, the Astros have been lacking a true closer, something they hope to have with the acquisition of Osuna. Of course, Osuna comes with his own set of problems. He was arrested in May on assault charges and subsequently given a 75-game suspension. That suspension is due to expire on Sunday when he will become eligible. However, he also faces a court date on Wednesday that could potentially derail his expected return. That is a calculated risk the Astros are taking by trading for Osuna. Obviously, the Astros believe Osuna is worth the risk. When he’s been able to pitch, he’s been one of the best relievers in baseball. He has saved over 35 games in each of the last two seasons and was an all-star in 2017. Before he was arrested this year, Osuna saved nine games in 10 chances with an ERA of 2.93. If he can regain that form upon his return, he will give the Astros the kind of closer they covet. However, this trade comes with no guarantees. Meanwhile, the Astros gave up quite a lot for Osuna. To be fair, he’s under team control through the 2020 season, so this is not just a short-term move. However, they sent the Blue Jays three quality arms to do it. Giles, of course, has had his problems. But given his track record, it’s not impossible to foresee a turn around with a change of scenery. He also has two more years of team control. Paulino and Perez are also two young arms that hold great value. Paulino struggled in six starts before going to the DL in late May. However, he was once one of Houston’s top prospects, so he holds high upside. Perez is also a promising prospect with elite stuff if everything comes together. Even if Osuna returns to form, that’s a steep price to pay. The Blue Jays, meanwhile, did quite well in this trade. For starters, they freed themselves of the uncertainty surrounding Osuna. Adding Giles can mean adding a headache. But getting prospects like Paulino and Perez should make this trade worthwhile. Of course, this trade is all about the Astros improving their World Series chances. Obviously, that is not guaranteed with Osuna missing nearly three months of action. However, given his upside, age, and recent track record, there’s a decent chance he’ll be able to pick up where he left off. Whether his legal troubles continue remains to be seen. However, for the Astros, trading for Osuna could be worth the risk.